Introduction: Gastric banding can assist in effective weight loss in certain populations. We hypothesized that a younger patient population would have improved weight loss when compared to an older patient population. Perhaps the younger patients would have a greater physical ability or motivation to exercise as part of their weight loss plan. Methods: We analyzed a prospectively maintained database which included all patients with laparoscopically placed gastric bands at the University of Virginia from September 2004 to October 2009. All band insertions utilized similar laparoscopic technique by 3 different surgeons. Patients ranged in age from 19-68 and received one of four different band types: AP Standard [Allergan], AP Large [Allergan], Realize [Ethicon], and the VG [Allergan]. Patient weight was recorded at one year follow-up and calculated as a percentage of loss (or gain) based on ideal body weight. Patients were grouped as “Young” in the 19-30 year old category and “Old” in the 60-69 year old category. A Student’s t-test was then utilized to compare the mean excess weight loss (EWL) after one year. Those patients without adequate follow-up were discarded from the data set. Results: The “Old” category consisted of 23 patients which resulted in a mean EWL of 26.6 (±4.1), while 16 patients in the “Young” category resulted in a mean EWL of 38.9 (±4.5). Student T-test revealed a p-value of 0.05 when comparing the “Young” to “Old” patient groups. 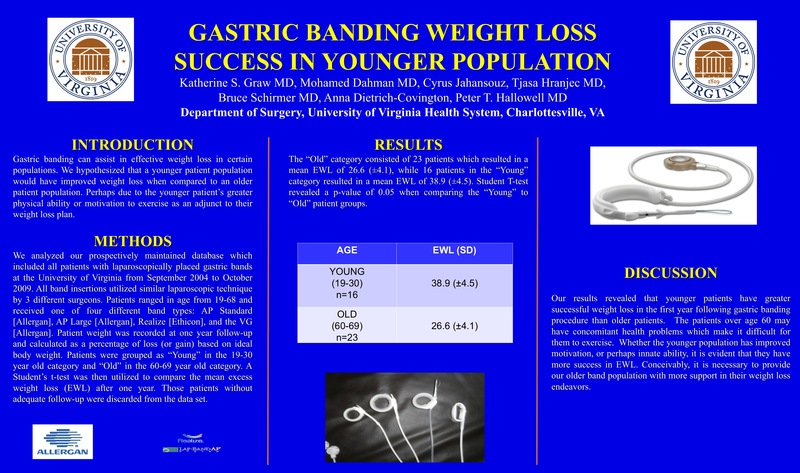 Conclusions: Younger patients under age 30, have greater successful weight loss in the first year following gastric banding procedure than patients over the age of 60.